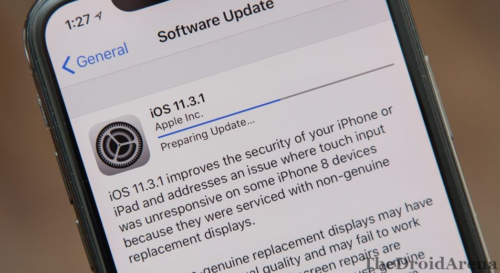 Using BLOBS to restore to iOS 11.3.1: Just a few days back, with the release of Ian Beer’s iOS 11.3.1 Kernel exploit in the public domain, the prospects of having a working jailbreak hack for iOS 11.3.1 brightened up. With Coolstar, the developer of Electra Jailbreak, announcing that they will be releasing a working iOS 11.3.1 jailbreak soon, utilizing the same Kernel exploit, the jailbreak community has got all reasons to smile and be happy. As Coolstar hasn’t provided any official release date for the iOS 11.3.1 jailbreak, you need to be patient enough and meanwhile prepare your iOS device to be compatible with the upcoming jailbreak. Check here how to gear up your iOS device for the iOS 11.3.1 jailbreak. One thing which you need to do is to restore or upgrade your iOS version to 11.3.1. However, bad news is that Apple has stopped signing the iOS 11.3.1 firmware. But, that doesn’t mean you can’t restore it anymore. In this post we are going to share with you the steps to restore to iOS 11.3.1 using BLOBS. Please note that you require a paid Apple Developer account for this method to work. In order to work with BLOBS, for the restoration purposes, you need to utilize the services of futurerestore and noncereboot1131 tool. You can download futurerestore and noncereboot1131 tool from the provided links. Please download the iOS 11.3.1 IPSW from ipsw.me. Noncereboot1131 is required for the purpose of setting up your nonce i.e generator from your BLOBS. For this, please utilize the services of noncereboot1131 Xcode project and install the same on your iPhone. That’s it! Please wait now for the execution of the command to complete. Cool! You are getting restored to iOS 11.3.1 using BLOBS. Please note that if you are using an iPhone X; the face ID won’t work after you utilize the above provided BLOB process to restore to iOS 11.3.1. However, touch ID does work. Can’t wait for iOS 11.3.1 jailbreak? Utilize Houdini semi-jailbreak for iOS 11.3.1 till then. Check out: Coolstar going to bring jailbreak for iOS 11.3.1 soon. If you are already utilizing a jailbroken iPhone then you don’t require a paid Apple Developer ID. The same is required, only for non-jailbroken devices for setting the nonce up. Jailbroken devices can use the System Info trick for the same which expands your information screen and you can change your nonce by just typing in the letters and numbers. So, this was our guide regarding using BLOBS to restore to iOS 11.3.1. Any questions, that you may have; please go ahead and put them down in the comments section below. Latest Houdini Semi Jailbreak for iOS 11.4 Demoed [Release Update]. iOS 11.2.6 Jailbreak: KASLR Bypass Tool for iOS 11.2.6. Hey guys. Please, need a help. My device is on iOS 10.1.1. It is not jailbroken. I have saved my 11.3.1 SHSH blobs. But I can not find tutorial how to upgrade iOS using my blobs. Can anyone help. I have searched many websites. even iclarified. But couldn’t find anything.